RAAF Spitfire 453 squadron fought in Europe. Based in UK they moved to France after D-Day the squadron. RAAF 451 Squadron fought in North Africa and the Mediterranean. When in 1943 was assigned to Defence of the Nile Delta area it operated Hurricanes and a detachment of Spitfire fighters for high-altitude interceptions. In early 1944 it was completely equipped with Spitfires and based in Corsica. Now its mission changed to support operations in Italy and southern France, missions consisted mainly in escorting bombers and conducting armed reconnaissance patrols. In late 1944 it was transferred to the United Kingdom, where it was based until moved to Germany at the end of the war. When fighters were needed to defend the Northern Territory from the Japanese Australia started receiving American fighters but Australian government wanted RAF Spitfires to be deployed to Australia. Spitfire had better high altitude performance than the RAAF P-40 Kittyhawk and was considered by RAAF as the best fighter Australia could get. 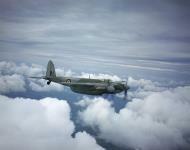 In 1942 RAAF 452 Squadron, RAAF 457 Squadron RAAF and RAF 54 Squadron were moved to Australia as 1st Wing RAAF. They saw a lot of combat over the first twelve months fighting Japanese bombers, recon and fighter sweeps. RAAF 79th Squadron was used in New Guinea and the Solomons campaign for protection of the airfields which the American heavy bombers used. In late 1943 79 Squadron relocated to Morotai. 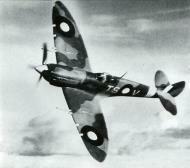 As Mk.V Spitfires were quickly worn out by combat operations in 1943 new Mk.VIII Spitfire started to arrive to RAAF. Unfortunately Spitfire plane was not rugged enough for the flying conditions of Northern Australia and the Pacific and had numerous technical and mechanical failures. It did not help that supporting Spitfire squadrons on remote Pacific islands proved to be a nightmare due to poor logistics. Operationally its short range was a handicap for the Pacific theatre. RAAF 551 Squadron was formed in Australia in February 1941. RAAF 452 Squadron was created in UK in April 1941. Started fighting in Europe and later transferred to Australia. RAAF 453 Squadron. Reformed in 1941 in June 1942 and equipped with Supermarine Spitfire aircraft to be part of RAF Fighter Command. Fought in Europe. RAAF 457 Squadron was created in UK in June 1941. Started fighting in Europe and later transferred to Australia. RAAF 79 Squadron was created In April 1943 in Australia. 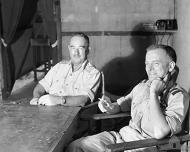 It included Australian pilots had already fought in North Africa. RAAF 85 Squadron was formed in 1943 with Brewster Buffaloes and in late 1944 received Mk.Vs retired from 79 Squadron. Polish officer presenting the Polish wings to Squadron Leader Clive Caldwell, the Australian CO of No. 112 Squadron RAF (The Shark Squadron), who alredy holds the DFC and Bar. The squadron inludes Polish fighter pilots, who have taken part in succesful engagements with the enemy from the very beginning. RAF Gambut, 24 March 1942. 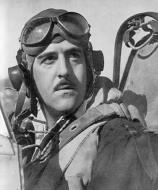 Squadron-Leader R H M Gibbes, Officer Commanding No. 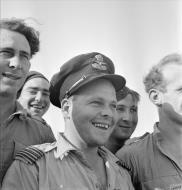 3 Squadron RAAF, at LG 91, Egypt, shortly after being awarded the DFC for his leadership of the unit in the Western Desert. After initial service with Nos. 23 and 450 Squadrons RAAF, Gibbes transferred to No.3 Squadron RAAF intime to see action during the Syrian Campaign in June 1941. He was rapidly promoted during his subsequent service in the Western Desert and took command of the Squadron in February 1942. Despite being shot down twice he continued to lead 3 Squadron through the Battle of Alamein and the Tunisian campaign before his tour finished in April 1943 with a victory score of 12 enemy aircraft shot down. Gibbes then returned to Australia to lead No. 80 Wing RAAF in the South-West Pacific from October 1944 to April 1945, and to serve thereafter with the Air Board in Melbourne until the end of the War. A De Havilland Mosquito IIF DD739/RX-X of No 456 Squadron, flying from Middle Wallop, in flight. The censor has scratched out the wing-tip antennae of the Airborne-Interceptor radar.